Imagine yourself in a secluded island oasis with tropical fruit trees and a private lot all your own. You will find yourself at 3818 Poinciana Avenue, a 2 bedroom 2 bathroom corner lot escape, filled with great amenities and property features. Each room boasts ample space, perfect for entertaining. The spacious, upgraded kitchen contains stainless steel appliances. The master bedroom soaks in tons of natural light, giving beautiful views of the private outdoors filled with tropical greenery. The lot sits on an oversized 25,600 square feet and contains a 2 car garage. The backyard not only boasts gorgeous mango, lemon, grapefruit, avocado, and palm trees, but also has a stunning new in-ground pool with entertaining space. This home is the definition of a perfect relaxation destination. This 2 bedroom, 2 bathroom residence is nothing short of spectacular. The gorgeous kitchen boasts deep wood cabinets, granite countertops, stainless steel appliances, and hardwood flooring. The dining room contains trey ceilings with a beautifully detailed design and wood floorings. You can find hardwood floors in the spacious master bedroom, and an upscale master bathroom with marble floors. A huge balcony, which can be accessed from all rooms, allows for stunning bay front and city views. Enjoy private access to the tennis court and pool. 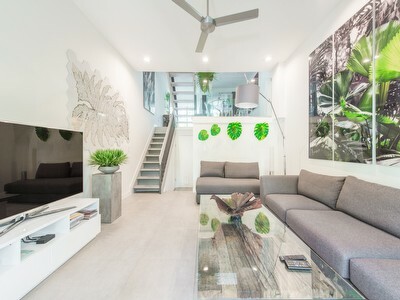 This condo is renovated to satisfy even the highest of expectations. 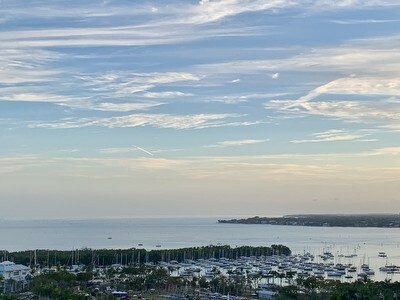 Interested in buying or selling a condo in Coconut Grove? Call Isabelle Andrews at 305-546-5421, Alba Biondi at 305-323-2595, or email us at theteam@groveexperts.com. This impeccable luxury townhome is everything you want and more. It is an incredible 3 bedroom 3 bathroom that combines comfort, beauty, and sophistication. The kitchen showcases magnificent finishes including granite countertops, marble floors, and a spacious breakfast nook. Each room offers ample space ensuring the highest level of comfort. Bedrooms include wide plank wood flooring and tray ceilings. The master bedroom even showcases stunning ocean views. The gated community with 24 hour guard ensures security and peace of mind. If that was not enough, a balcony, elevator, and a huge roof terrace with a jacuzzi and ocean views are all included in the townhome. Every part of this home is a masterpiece and it’s waiting for you to enjoy! Interested in this property or another in Coconut Grove?